The beach is one of the destinations where I can completely forget about the hustle and bustle of Manila, as I stare blankly onto the shore. Recently, I went to the island of Boracay for a 4D/3N stay to do just that. Asking for recommendations of a comfortable and inexpensive accommodation via Twitter, Angela and Adrian both suggested Island Nook Hotel. I looked it up on the Internet and decided to give it a try. Besides, I'd rather stay in a place where two people recommended rather than just go for any random place. Since May is still considered as a peak season, the Single Standard Room of Island Nook Hotel was priced at Php2,200 (max of 2 persons) with breakfast. However, the usual rate for low and high seasons are around Php1,400 and Php1,900 respectively. Upon arrival at the Cagban Jetty Port, I told the driver to bring me to the Budget Mart, since I was afraid that he doesn't know where Island Nook Hotel is. Besides, my friends told me it's just a few walks away from the said convenience store. Island Nook Hotel isn't hard to find at all. When I alighted from the Budget Mart located at the back of D'Mall, I walked towards BPI till I saw the Island Nook Hotel logo. 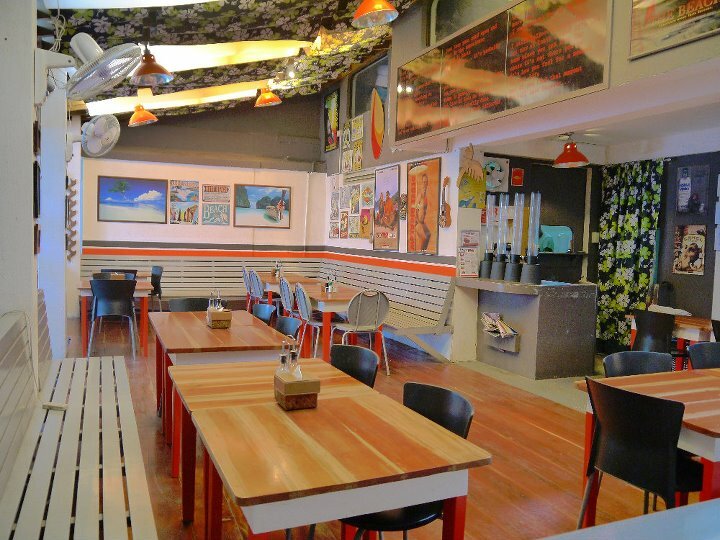 With twenty rooms, the boutique hotel is conveniently located along Boracay Highway Central between stations 1 and 2. Checking in was a breeze as I only needed to present my Agoda confirmation certificate and then fill up a form. When I entered the room, I was happy with what I saw. It was plain, clean, a bit small, but very much movable. The mattress and pillows were very comfortable and pleasant-smelling, for which it confirmed that it has been newly changed. There's a small bedside table for personal things and a socket great for charging cellphones and iPads. The room was brightly lit, too. The picture above was taken with the lights off and the window curtains a bit open. As you can see, the room also has another table for the bags - I think it wouldn't fit huge bags though. There's a television capable of watching cable channels as well. The corner of the room has a plastic shelf that has two towels for personal use. Since I didn't bring a lot of things, I wasn't able to utilize the other compartments. Nevertheless, it's nice that they provided it for convenience. Do you see the sink? I love it! It looks cute and quite unique to see it outside the bathroom. I just had to be a bit careful not to spill any water on the floor, but it's cool! Here's how the bathroom looks like. Again, it's pretty straight forward with the toilet bowl and the shower. What I didn't like though is that it doesn't have a curtain. As such, the bathroom can get a bit messy when the water goes over the line. BUT, the bathroom has a bidet - sosyal! The next morning, I went to their in-house restaurant called Island Kebab to claim the inclusive breakfast. The resto is located just behind the check-in counter and a floor down from the rooms, so not much effort to eat. I had the Trondzilog, a mix of of tapa, longganisa, hotdog, garlic rice, egg and, a cup of coffee. In fairness, it wasn't so bad. Apart from breakfast meals, they also serve Filipino rice meals, Persian dishes, sandwiches, and pasta. Overall, I had a pleasant stay at one of Boracay's budget-friendly places - Island Nook Hotel. Not only does it provide comfort and homey feel, but it's basic amenities and location are of great convenience to tourists like me. 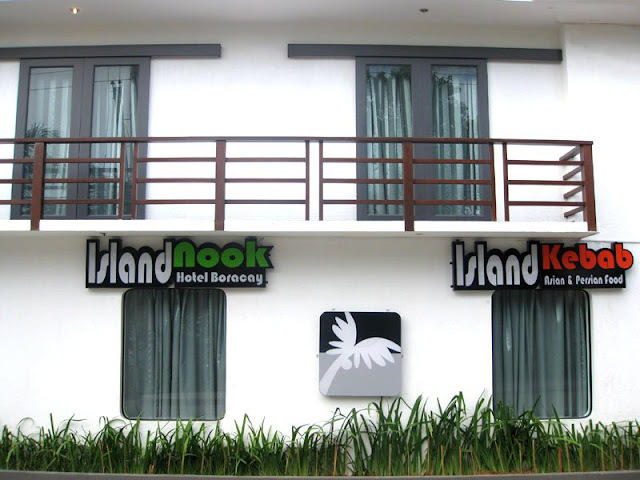 If you wanna check out the room pictures and reserve for an upcoming trip, do visit the Island Nook Hotel website. I like the nifty-plastic-shoe-shelf-turned-towel-holder idea.. I think that's just what our room needs. Hahaha! So it's really for shoes?? Haha, I'm not too sure, but I usually see it labeled as shoe holder something. I see. :) Well, for whatever it is, it's useful. I like the room, simple and classy but it looks so small? you got it for 2,200 per night?